By Bob Marovich for The Black Gospel Blog. It could not have been easy for Charles Jenkins to succeed the iconic Rev. Dr. Clay Evans as Pastor of Fellowship Missionary Baptist Church in Chicago. Evans, a Civil Rights leader and founder of “The Ship,” had taken his church from very humble roots to one of the nation’s most significant religious institutions. Fellowship’s radio choir was no less celebrated than the church it represented. Directed at the beginning by Willie Webb and later by Evans’ sister, the dynamic LouDella Evans Reid, the Fellowship choir began recording fifty years ago under the tutelage of Idessa Malone, Patron Saint of Church Recordings. The choir and its band of soloists and musicians were one of a handful of Chicago church music deparments that created the Gold Standard of gospel chorus singing. In return, it earned awards and sold who-knows-how-many singles and LPs, including the marvelous I’ve Got a Testimony. The Best of Both Worlds, the church’s latest project, introduces Fellowship 2.0 by first honoring the church’s music roots. A high-spirited “Fellowship Medley” of favorites, including the church’s theme, “What a Fellowship,” is dedicated to Rev. Clay and “Mama Lou” Evans Reid. 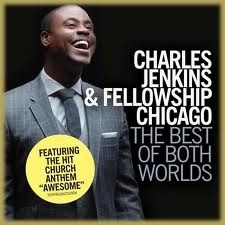 The traditional churchy sound cultivated by Fellowship is well represented by the up-tempo retelling and updating of the Hebrew Boys story on “A Word For Me.” The quintessential gospel waltz tempo drives “Grace and Mercy,” and on “Giving Honor to God,” Jenkins assumes his preacher’s cadence to remind the audience to give honor to God like the old folks did. The album concludes with the roof-raiser “Releasing My Faith,” which on the reprise releases a praise break. This is exactly the album Fellowship needed to release at this point in its history. Its decision has paid off: both the album and “Awesome” made it to the number one position on the Billboard Top Gospel Album and Singles Charts, respectively. In its seventh decade, The Ship Yet Sails!